A few months ago I was scanning my inbox when I came across an email from Vogue Magazine for an interview request. I used to see the cover of the magazine all the time while waiting in line at the grocery store, but I never knew what it was about. So after receiving the interview request, I went straight to Wikipedia to find out. I learned that Vogue is an American fashion and lifestyle magazine with a total audience of 11 million. 11 million! Wow, thats more readers than rock climbers in the US. I hope they know that I wear socks with sandals and think it is cool. Why on earth would a fashion magazine be interested in my rock climbing injury expertise? It turns out that the author, Meaghen Brown wanted to write a short story that shows how rock climbing is a great activity to tone the body and stay fit. So I interview with her and added some quotes to her piece. So next time you are at the grocery store, choose the longest line, grab the November Vogue and flip to page 170 for an interesting read on climbing. The article is titled: “Lift off: A conversion to climbing takes to new heights of fitness.” I have included the full interview below if you are interested in checking it out. Vogue: What kinds of moves and athleticism does a single climbing session entail? Climbing is a unique sport that utilizes the entire body. The sports is similar to gymnastics where strength to weight ratio commonly can give an advantage to perform challenging moves. It is similar to yoga where it is helpful to have flexibility and control. It is similar to dance where you have the freedom to express yourself through movement. However, it is unique in respect to two interesting characteristics: ape index and finger strength. Ape index measure of the ratio of an individual’s arm span relative to their height and can allow climbers to gain an advantage by grasping far to reach holds. Finger strength is also important climbing because the sport often requires climbers to grasp onto miniature holds to support the body weight. Climbing is also very technique based involving thousands of unique movements. I remember back to when I first started climbing. I just chalked up and learned as I went. Struggling and flailing up a route until either I found a strategy that worked or we got stronger. Contrast that to any other skill sport such as golf, tennis or gymnastics where movement is trained and refined by technique coaching on a regular basis. Climbing is a skill sport and proper movement patterns are essential to success. 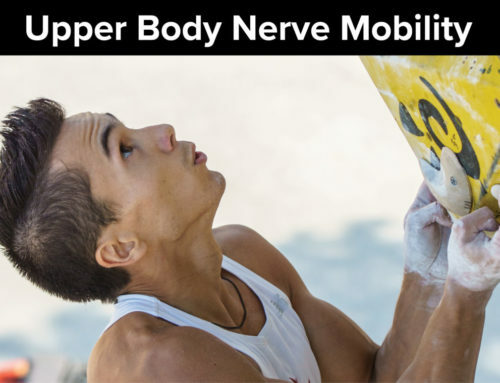 Unfortunately, the majority of climbers acquire our skill and technique without formal instruction of safe and efficient movement patterns. 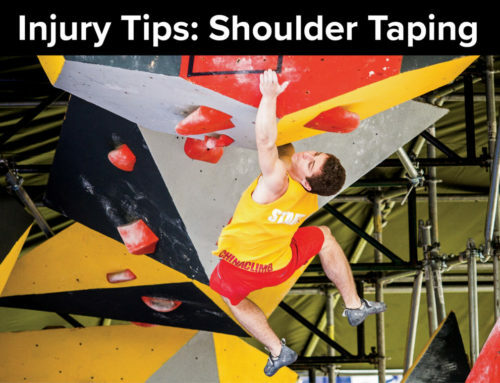 The absence of a proper foundation of movement leaves you susceptible to overuse injuries and may limit climbers from taking their climbing to the next level. Below are the 5 key tips I recommend for climbers. Keep Good Posture: When your body is aligned with good posture the muscles can act more effectively and are less likely to strain. Climbing posture is similar to seated posture. Keep your trunk upright, shoulders back and shoulder blades gently squeezed together. This will create a powerful foundation from which to move. Bring Your Hips into the Wall: Your center of mass is a point around which the weight of your body is concentrated and the force of gravity acts. That means, the closer your center of mass is to your toes, the less gravity acts on your shoulders, elbows and fingers. The way you move your center of mass closer to your toes (on steep or overhanging rock) is by bringing your entire pelvis towards the wall or by rotating one hip into the wall. You will climb more easily by not fighting gravity as much. Straighten Your Arms: As humans evolved into upright creatures, we began to interact with our environments with straight legs and bent arms. This is why it seems unnatural for climbers to bend their knees and straighten their arms while climbing. However, when you bend your knees and straighten your arms, your weight transitions into your powerful legs where your body has the most strength. Push With Your Feet: The muscles in your legs are the largest in the body. They are developed to support your full body weight. This is why they are so much bigger than your arms. When you push with your legs to move your body to the next hold you are moving more efficiently than pulling with your arms. Always think to first push with your legs then only pull with your arms if you have to. Climb Like You Crawl: Babies learn early on the most efficient ways to maneuver in their environments. They learn how to crawl by moving, for example, their right arm first and then their opposite left leg, and then their left arm followed by their right leg. Climbing like a baby is the most efficient way to climb. Vogue: What are the best ways to warm up, make use of your time and the gym, and cool down? If you have an hour, or an hour and a half, what should you be doing? Your warm-up should include cardiovascular activity (jogging, jump rope, cycling) for several minutes and then a dynamic warm-up before you climb. A dynamic warm-up means that you smoothly move through a full range of motion spending equal time in each part of the stretch. This is what all of the research for the past 15 years has supported. Static stretching, when you hold a stretch for typically upto 30 seconds is dangerous to perform before climbing and can lead to injury. This is very important to note because I see it being done all the time. If you have an hour you should warm-up for about 15 minutes. Start then with 5-6 climbing easy routes. Once the body is fully warm and you are completed with easy routes, you can begin to challenge yourself with harder routes. Once form or technique break down, then you should end your session to avoid injury. Then cool down with some gentle stretching. Vogue: What specific muscles or muscle groups does climbing use and engage? Climbing requires the use of almost every muscle in the body. It is common for newer climbers to relay too much on their finger strength and arm muscles. The key is to use your legs to push your body upwards, not your arms to pull. Also a strong core is essential to transfer energy from your feet to your arms. In additional to the major muscle groups they two muscles are important. Flexor digitorum profoundis: there are over 30 muscles in the hand, wrist and fingers. These are essential to grip onto small holds. One of the more important muscles is the one that flexes the tips of your fingers. Flexor hallucis longis: an important big toe muscle. When balancing on small hold with your feet, this small muscle in your big toe flexes to support your entire body weight and take pressure off your fingers. Vogue: What are the physical benefits you can get from climbing that you can’t get from any other sport or activity? Allows you to use every physical aspect of flexibility and strength at the same time you are use your mental capacity to problem solve. It is a combination of gymnastics, yoga and dance on a vertical wall. Vogue: What tips do you have for getting the most out of climbing, especially, but not limited to, if you’re just starting out? Have fun, don’t compare yourself to others, listen to your body and be mindful of your movement. Do you offer your book in print version? Please let me know.